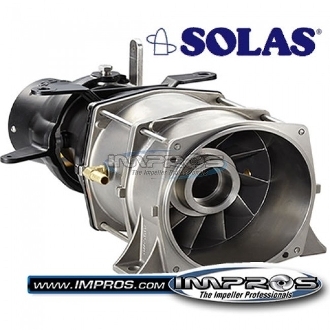 The Newly released Solas Yamaha 144mm 12 Vane Complete Pump Unit is a stainless steel vane section with a 75mm bearing carrier. This pump is a "Standard Position", and includes a stainless steel wear-ring section, as well as an incredibly valuable drop nozzle system- both the venturi, and steering nozzles, machined and including rings so you can later interchange the diameter of nozzles! Flip the nozzle and convert it to an UP nozzle for Freestyle! The pump fits most Yamaha PWC using the 144mm pump from the factory, like a Super jet, Wave Blaster and many more. It is also often custom-installed on other PWC. This Performance pump drastically improves bottom end and rough water performance of your ski. Any closed course racer knows the incredible gains that a 12 vane performance pump gives them. Many freestylers are going to this pump to give them "Maximum" hook up for tricks.